Osteoid osteoma is a benign tumour in young adults. The clinical manifestations are generally typical nocturnal pain that prevents sleep and that is alleviated with aspirin. When the typical clinical and radiological features are present, diagnosis is not difficult. Problems in the differential diagnosis may arise in connection with an unusual location. 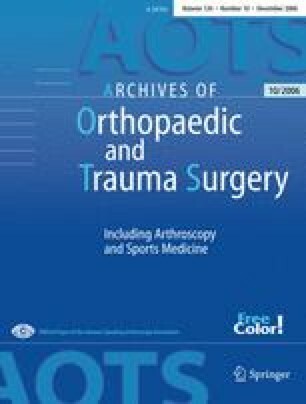 We report on the clinical features, radiographic and histopathological findings, treatment, and results of four patients who were managed for an intra- or juxta-articular osteoid osteoma at our medical centre between 2000 and 2002 and in whom the initial diagnosis was erroneous and delayed from 1 to 10 years. In order to remove these lesions, we performed a CT-guided en block retrograde resection under arthroscopic control for juxta-articular osteoid osteomas (knee) and an arthroscopy-assisted en block antegrade resection in two cases of intra-articular osteoid osteoma (elbow and shoulder). None of the osteoid osteomas recurred in the follow-up period, and each patient got relief from pain.